Emoto Music’s featured artist, Loud Forest recently enjoyed their first airplay on the World Famous KROQ for their song “True Love/True Love” during Rodney On The Roq, hosted by the legendary KROQ DJ Rodney Bingenheimer! Listen to Loud Forest’s “True Love/True Love” below and check out the full playlist from the July 25 show here! 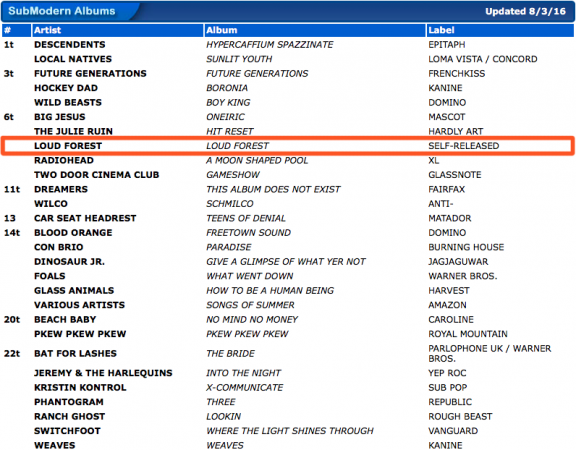 But that’s not all from our favorite rockers, their self-titled and self-released debut album “Loud Forest” recently charted at number 6 last week on FMQB’s Submodern Album chart! See the full chart from the week of August 3 below.